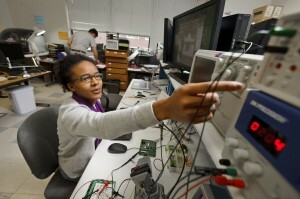 The School of Engineering at Shippensburg University offers a Bachelor of Science degrees in Computer Science (CS), Civil Engineering (CivE), Computer Engineering (CE), Electrical Engineering (EE), Mechanical Engineering (MechE) and Software Engineering (SE), and a Masters of Science in Computer Science. Our CS, CE, and SE programs are ABET-accredited. The newness of our other programs precludes accreditation, but we will pursue as soon as possible! The goal of all of our programs is to provide students with the skills necessary to succeed in the computer science and engineering professions. In each of our programs, the primary focus is to prepare students for professional, engineering, or academic careers; the success of our graduates speaks for itself! The School of Engineering has approximately 220 students and 7 full-time tenured or tenure-track faculty. Computing facilities include over 100 workstations and servers, Zynq-7000 FPGAs, OMAP3530 processors, LEGO robots, and many advanced development and design software, such as Xilinx, Cadence, SolidWorks, and AnSYS tools. The department offers many opportunities for students to become involved, including the Programming Team, Women in Computer Science (WiCS), Directed Research, the BROADSIDE center, and business internships. We welcome prospective students to come and visit the department. To schedule a site visit, contact our Admissions Office (admiss@ship.edu).